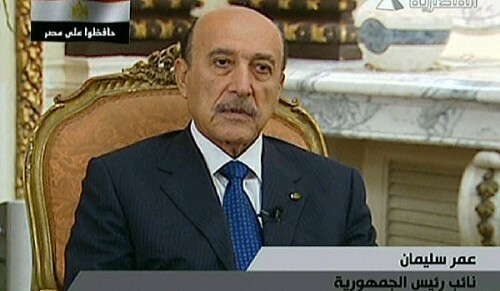 Assassins failed to kill Egyptian Vice President and security chief Omar Suleiman. Two of his bodyguards were reportedly killed in the attack. A failed assassination attempt on Egypt’s vice president in recent days left two of his bodyguards dead, U.S. sources tell Fox News, though that information has yet to be confirmed on the ground in Cairo. Such an attempt on the life of Omar Suleiman would mark an alarming turn in the uprising against the government of President Hosni Mubarak, who only recently named Suleiman as vice president in an effort to quell the unrest and possibly line up a successor. “I’m not going to … get into that question,” Gibbs said. Sulieman blamed foreigners and political opponents within the Muslim Brotherhood for 10 days of turmoil that has rocked the nation. “It’s amazing this hasn’t been picked up … because he is the transition plan, or at least one of them for the Egyptians,” the official said.